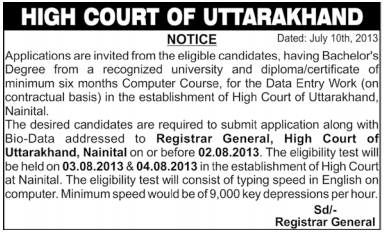 Applications are invited from the eligible candidates, having Bachelor’s Degree from a recognized university and diploma/certificate of minimum six months Computer Course, for the Data Entry Work (on contractual basis) in the establishment of High Court of Uttarakhand, Nainital. The desired candidates are required to submit application along with Bio-Data addressed to Registrar General, High Court of Uttarakhand, Nainital on or before 02.08.2013. The eligibility test will be held on 03.08.2013 & 04.08.2013 in the establishment of High Court at Nainital. The eligibility test will consist of typing speed in English on computer. Minimum speed would be of 9,000 key depressions per hour. Please refer to the official advertisement below for more details. Don’t forget to Verify the Subscription from your Mail Inbox.